Lyme disease is a condition acquired following a bite from a tick, and the classic Lyme disease rash follows up to four weeks after the initial bite has occurred. Skin - presenting with the initial bite and developing a rash over a period of weeks. The Heart- including the risk of arrhythmia, inflammation of the heart tissue and heart failure. Joints - a condition called 'Lyme Arthritis' can occur sometimes years after the initial bite. This condition is however rare. The Nervous System - known as 'neuro borellia' a serious condition involving the nervous system is also one of the more serious effects of Lyme disease. This condition occurs between one and five weeks after the initial bite. Can Cats Get Lyme Disease? It is important not to assume that all tick bites automatically lead to the development of Lyme disease. It is only following the onset of unusual symptoms and medical advice that Lyme disease will be diagnosed or ruled out. Remember also that if a rash develops even after a tick bite it may be due to a more common cause for a skin rash. The skin rash associated with Lyme disease affects approximately 60 percent of those with the disease. Initially a red spot will appear at the location where the tick has bitten, over time the red spot will increase in size. As the infected area develops a rash called 'erythema migrans' appears. A bite that becomes true to Lyme disease will as it grows present with a 'bullseye' or target-like appearance with the outer edge of the marking appearing darker than the inner area. On those with dark skins the Lyme disease rash appears more in the form of a bruise due to skin pigmentation differences. The erythema migrans rash can grow to the size of anything from a small coin to a rash that is prominent on a large part of the torso. It is important to acknowledge that although the tick bite mark may be evident immediately, the rash that then develops can do so at any time during the development of the disease. On occasions the rash may only appear after more serious symptoms have begun. Although the rash itself is a reasonable indication that Lyme disease has infiltrated the body, it is commonplace on suspicion of this that a doctor will perform a blood test. The Lyme disease antibodies may not be detected in the blood for up to eight weeks therefore if symptoms persist of worsen the doctor is likely to repeat the blood test. Treatment using medication such as oral antibiotics is common practice, particularly in the early presenting stages of the disease. Research carried out by scientists in the U.S has suggested that antibiotic treatment needs to be administered for anywhere between twelve and eighteen months to fully eradicate the disease. Treatment given for any less than this is likely to result in further spread and worsening symptoms of the disease. Cover up - wear clothing that covers up the greater surface area of the body. Wearing long sleeves, long trousers and a hat with a wide brim are suitably appropriate attire in areas where risk may be high. Remove the tick - particularly useful for those who could immediately recognize a tick. 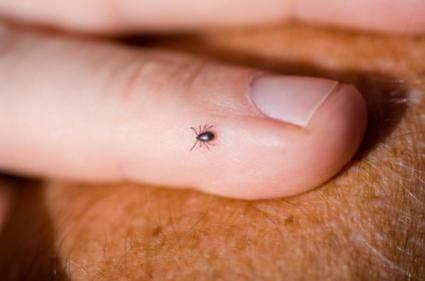 Removal is one way of reducing the impact the tick may have on the body. Although it may have latched on to the skin surface, removal may be possible before the tick penetrates the skin. Ticks should not be removed with bear hands, and ideally tweezers or fingers protected with gloves should be used. Use repellents - a product called 'Permanone' may be useful for the seasoned walker or those who work in high risk environments. The product is applied to clothing and acts as a repellant. Permanone should never be applied directly to the skin as it is classed along with pesticides which are known to be hazardous to health.